'Oak Hill', the Arthur S. Burden estate designed by John Russell Pope c. 1915 in Brookville. 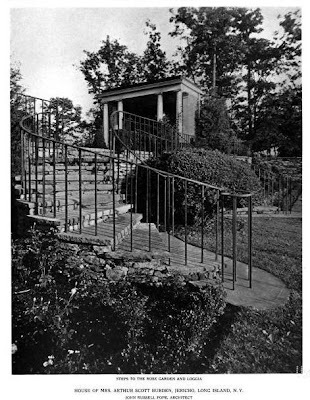 Click HERE and HERE for more on 'Oak Hill' and HERE to see the brochure from when the estate was for sale. The residence is no longer standing. The flat facade is also not what I would choose but it's not a bad look. 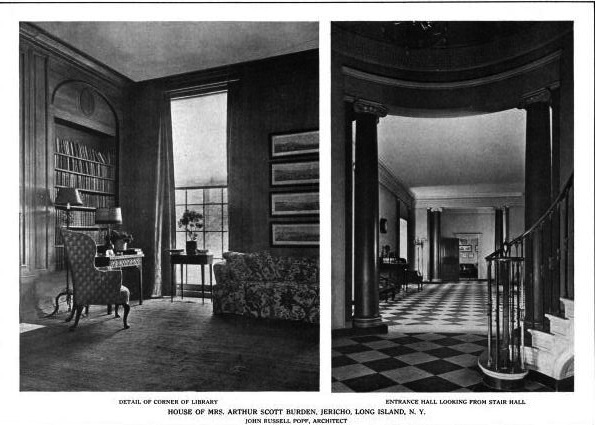 The layout of the public rooms is very good; that small room to the left of the staircase is labeled “school room;” & at the opposite end of the entry hall is the reception room. • The servants’ hall is that L-shaped room that shares a wall with the school room, isolated from almost everything – why not move or extend it north to the outside wall of the scullery & have an interior connecting door there? Why was there a need for that recessed porch before coming inside? 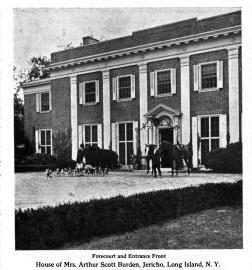 • There are, I believe, five servants’ bedrooms & 1 ½ baths in the far left wing; I like the breezeway between the servants’ porch & whatever is west. But I see no way to get from three of those bedrooms to the full bath or from any of those bedrooms to inside the main house without first having to go outside & across the servants’ porch. It just seems really inconvenient for everyone. I think it's very, very hard to look at the gardens here, which Zach covers specifically in a linked post, and not come away with a real admiration for the lady of the house. The linked article doesn't say who designed the gardens -- Pope, Mrs Burden, someone else -- but it's a lovely, practical plan for someone who probably wasn't content to just wave her hands and hope the servants got it right. mea culpa. I'm way off in my assessment of the floor plan---the service wing actually has a second floor, as I see by looking at the long view real estate brochure---as opposed to the carefully composed view of garden wall fronting it, and there is a second floor. I am however, probably correct about those detached first floor rooms being for the male staff. Now I'm going back to work. I'm changing my name to Down East Dummy. I was right the first time. The real estate brochure lists 7 maid's rooms on the third floor, hidden behind that infernal parapet. I should read before I comment. Now I really am going back to work. Six Degrees of Separation: Mrs. Burden/Cary was the sister-in-law of James A. Burden of Woodside Acres in Syosset; the great aunt of Princess Diana (Mrs. Cary's brother Lord Fermoy was Diana's maternal grandfather); her daughter Eileen Burden married the son of Walter Maynard of Haut Bois in Brookville; and was the great grandmother of actor Oliver Platt. I could take this full circle and add that Walter Maynard's sister Audrey married the brother of Louis Auchincloss, who in turn married Sheila Lawrence, the granddaughter of James A. Burden of Woodside. It is always a source of amazement to me that the old WASP hierarchy didn't suffer from six toes. LOL DED, if they had developed six toes it would have become de rigueur & a whole new shoe industry would have been born. 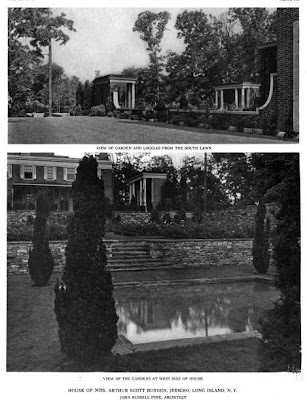 On the page 81 of the 'Life' magazine DED linked to is a photo of the entrance to 'The Elms' at Newport. I point this out only because of a recent conversation regarding the use of naked light bulbs to light houses in that gilded age era -- directly over the front door on the inside ceiling is a single naked lightbulb. It just looks so odd to [my] modern eyes. Here is an unrelated question? What was the square footage of Harbor Hill? What was the acreage? Many sources have different numbers? Obviously you never played "Count The Toes" at the Cold Spring Harbor Beach Club. I thought the exact same thing when I saw it...talk about ancient! Are there prizes involved with the unrelated Harbor Hill question? Many accounts have 648 acres, but I dont recall a square footage number. Maybe the Richard Guy Wilson book on Harbor Hill goes into that, but I presume like many statistics such as room counts and square footage, the numbers will vary widely. regarding Oak Hill, I presume the contemporary Tam O-Shanter country club now sits on the majority of the estate site with little remaining of the former property. Determining the square footage of these houses is like fishing tales---even when the statistics are already wildly impressive, there is still a tendency to add value. Another thing about this house that deserves mention -- notice how the interior photographs emphasize the light (and presumably the exterior views). Given all the recent carping about gloomy interiors, this house seems different -- by design. Yes, this house has lovely interiors--light, graceful and well proportioned, tall windows, lots of access to the outdoors. As I may have carped before, I find some of those 'Ye Olde Merrie Englande' interiors with all their dark heavy linen fold paneling and hooded stone fireplaces and mohair and velvet upholstery rich and handsome, but at the end of the day (and probably in the middle of the day as well) to be gloom fests. One half expects the beheading of Anne Boleyn to be re-enacted as after dinner entertainment. I've been contemplating the service wing problem: It has become clear that originally, the service wing was designed to be long and low, hidden behind a wall that balanced the garden wall on the other side. Elegant. 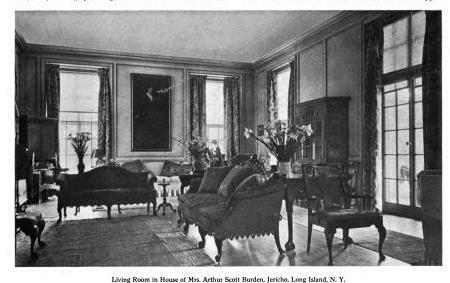 At some point, Mrs. Cary appears to have decided that she needed three more servant's rooms to add to the twelve (five on first floor, seven on third floor) that she already had, to say nothing of the three cottages and three staff flats contained in the auxiliary buildings on the estate. So, she had a second floor built over at least part of the service wing. DED, I believe you are correct about the addition. 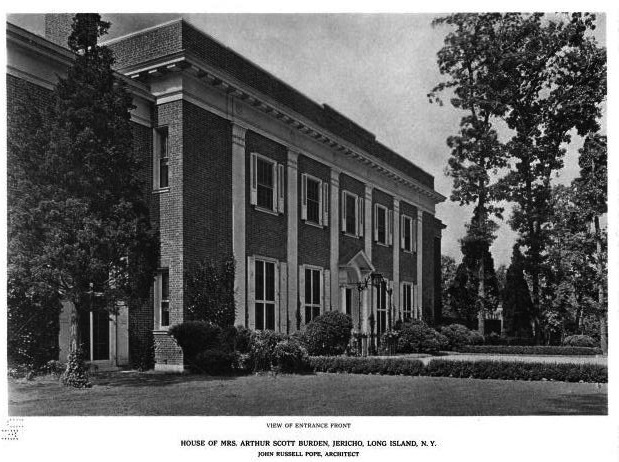 In the For Sale brochure it states there are three servants' rooms on the second floor in addition to an undisclosed number on the first floor & seven on the third. 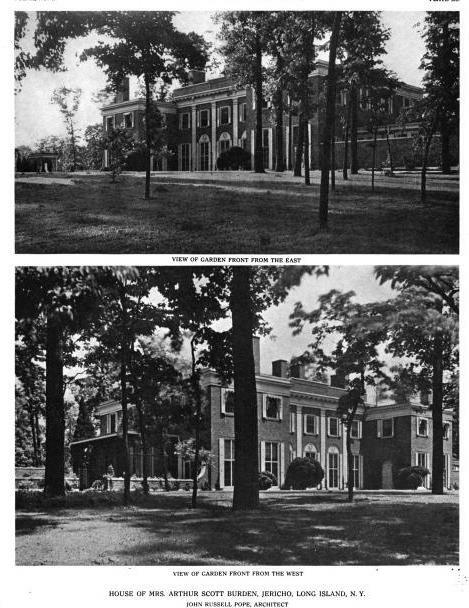 & the brochure's cover photograph of the back of the house clearly shows a second story over the kitchen wing that was not in the floor plan shown in the 1916 'The Brickbuilder' magazine. 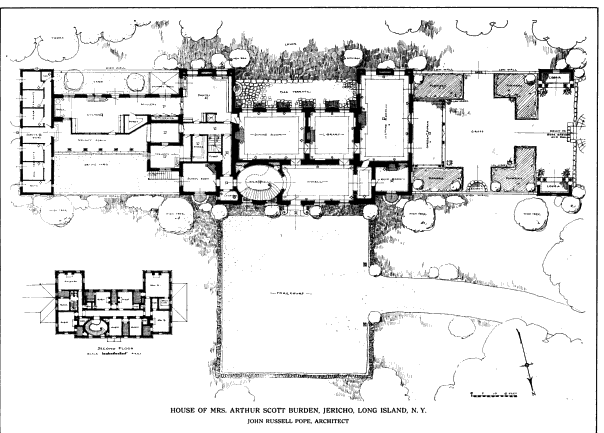 The For Sale brochure also lists a housekeeper's room on the first floor which is not in the floor plan, so I'm guessing Mrs. Cary reshuffled some floor space & maybe didn't add as many servants' bedrooms as first it seems. The other comment I have is that, if DED is correct about which bedrooms were allocated to the male servants (& I suspect he is), then the original intent of Mrs. Arthur Scott Burden was to be able to lock the male servants out of the main house at night ... hmmm? DFP, exactly the evidence I considered---along with the photographic evidence---when I arrived at my conclusion. Clearly I'm procrastinating about a writing project today, hence I'm instead considering things like Mrs. Cary's servant housing. And it's unlikely that Mrs. Cary wanted to lock the menservants out---after all, one expects one's valet or one's butler to be available 24/7---but definitely to effect a firm separation of the sexes. Doug, my Christmas present to you are these two scholarly examinations of two of the Vanderbilt houses---The Breakers and Hyde Park---complete with plans. The service arrangements of the Breakers are labyrinthine and complex, embedded within that vast edifice, complete with entresol floors and embedded passages for the invisible movement of service functions. It reminds me of nothing so much as a beehive or an ant farm. Enjoy. DED, thank you for your gift. I regret I do not currently have something of equal interest to offer in exchange; so I am beholding. Obviously, I have not yet digested all 670 pages of these two documents; but you know I will. In a way I understand but it also seems odd in a way that gilded age society needed lots of servants but wanted those servants to be as invisible as possible (I guess it's sort of like wireless remote today); except for footmen who were often used for showing off just how rich one was. & I’ll take this moment wish everyone a joyous holiday season & a very happy 2012. 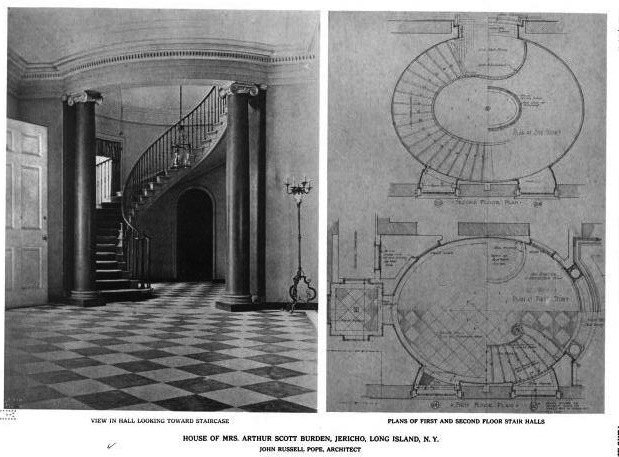 Jefferson designed his houses just the same way. DED, thanks from me also for those links and for your many enlightening comments. I'm also a floor plan freak and love any chance to peruse one. I did have a problem with the first link, as it just brought up the Preservation Society home page. Can you provide another link? DED, that did the trick. Thanks again. Gotta say, I'm very impressed with your resources (especially having spent some time on your blog as well).